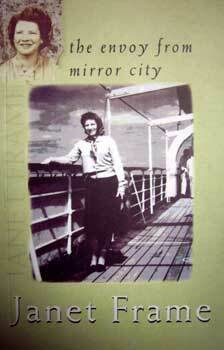 'the envoy from mirror city' is the third book of Janet Frame's three-volume autobiography, first published in the 1980's and described by Michael Holroyd as 'one of the greatest autobiographies written this century'. It describes her travels overseas and her entry into the saving world of writers and the 'Mirror City' that sustains them. In 1985 it won the prestigious Wattie Book of the Year Award. Janet Frame was born in Dunedin in 1924. She was the author of eleven novels, five collections of stories, a volume of poetry and a children's books. She was a Burns Scholar and a Sargeson Fellow, and won the New Zealand Scholarship in Letters and the Hubert Church Award for Prose. She was made a CBE in 1983 for services to literature, awarded an honorary doctorate of literature from Otago University in 1978, and one from Waikato University in 1992. She received New Zealand's highest civil honour in 1990 when she was made a member of the Order of New Zealand. Janet Frame died in January 2004.